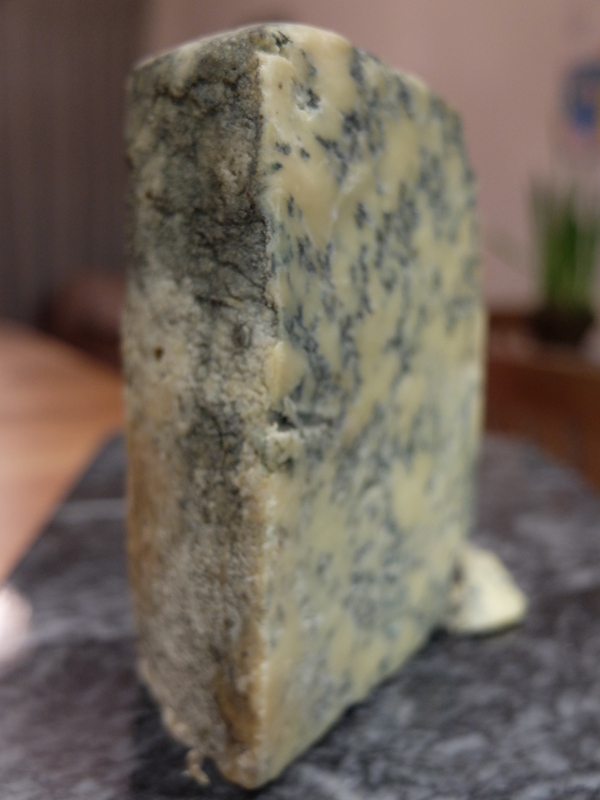 Hebridean Blue is a blue, unpasteurised, cow’s milk cheese made by Jeff and Chris Reade on Scriob Ruadh Farm (pronounced Ski-Brua and meaning Red Furrow) on the Isle of Mull. Somerset-dwellers originally, the Reades moved to the farm near Tobermory in 1979 (for carefree folks without children, Tobermory is famous for its whisky distillery; for the rest of us it means the 6am enforced watching of Balamory, filmed in the town and recognisable by its colourful buildings and irritating characters). The farm was practically derelict when they bought it; like true farmers they put a roof on the cowshed first, before they set about fixing up the house. The Reades have a mixed herd of Friesians, Ayrshires, Jerseys and some Brown Swiss. They are milked in the morning and the fresh milk goes straight from the milking parlour to the cheese vat. Their milk is most famous for being transformed into Isle of Mull cheese, a cheddar-type cheese. Hebridean Blue (also known as Isle of Mull Blue) is a relatively new invention. The only blue cheese made in the Hebrides, it is made with animal rennet and aged for twelve weeks. As you can see from the photograph this is a very blue cheese. In fact, I think it may be the bluest British cheese I’ve ever seen. There’s very little white it’s so blue. As you would probably expect, it packs quite a punch. The flavour is not dissimilar to a good Stilton but by ‘eck it’s a gum-burner! If you like blue cheese, you’ll like it a lot; if you hate blue cheese, you’ll pay someone to come and remove it from your fridge. Interestingly, if my cheese gestation calculations are correct, my slab must have been made in about late October. When the cows go inside for the winter, their silage is supplemented with the spent grain husks from the aforementioned local distillery which is said to give their cheese feisty, sharp flavours. And feisty it certainly is. If Caboc is the chalk, Hebridean Blue is the cheese. Ha! I see what you did there 😉 It does look very very blue….! Maybe needs a good glug of red with it….? OK, that settles it. I’m going to have blue cheese(s) and red wine for dinner! Thank you for the inspiration!! Now this is my kind of cheese! Oooh no, he is just too blue! I think I would need a vat of red wine before I even contemplated him . . .
Wowza that’s the bluest cheese I’ve ever seen! Can’t wait to be stuck on a hot boys with a few hundred grams of that bad boy! !